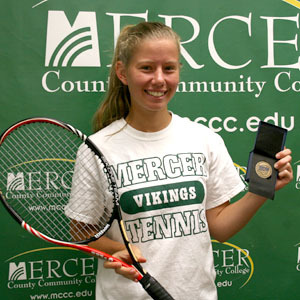 West Windsor, N.J. -- Freshman Alison Noll, of South Brunswick, has entered the record books at Mercer County Community College. She is the first woman in school history to win the National Junior College Athletic Association (NJCAA) title in tennis at No. 1 singles. And, she says, she had a whole lot of fun doing it. "It was an awesome experience," Noll says of her trip to the NJCAA Tournament May 6-12 in Tucson, AZ. "I was really focused on the court and had a great time off the court." Focused indeed. Noll sailed through her quarterfinal match against Ocean CC 6-0; 6-2, as well as her semi-final win versus Gloucester 6-2, 6-0. Her only real worry came as she prepared for the final against the No. 1 player from Oxford CC (GA), who was the runner-up at no. 1 last year. The player proved no match for Noll, who soundly dispatched her 6-1, 6-0. This First Team All-American has made a huge turnaround since her decision not to play Division I tennis at St. Joseph's University in Philadelphia, after spending some time there last summer. Noll knew herself well enough to recognize that it just wasn't a good fit. "I was tired of playing and I realized I was just not ready to go so far from home," she says. With no idea of her next step, Noll's dad suggested Mercer County Community College, whose Communication program, Noll's area of interest, had a great reputation. She enrolled at Mercer and began her classes in August, still with no intention of joining the Vikings squad. But Noll found she could not abandon her sport completely. Midway into the season she contacted MCCC Coach Marc Vecchiolla, whom she knew from her appearances in tournaments at the Mercer County Park Tennis Center, where he is the director. She simply wanted to pick up a racquet again and asked if she could come out and practice with the team. Before Noll knew it, she had joined the squad at first singles. "I decided to have some fun with it. I had no idea what the outcome would be," she recalls. By the end of the Region 19 Tournament on Oct. 16, Noll had earned the title at No. 1 singles, as well as a trip to nationals, along with doubles partner Katie Courtney. In January, Noll and her teammates took up Vecchiolla on his suggestion to play a spring season. The team began practicing three times a week, which increased to daily once the season commenced. And while she was somewhat nervous going into the tournament, Noll had a good idea of most of the competitors she would face, having beaten players from three of the teams that were also at the tournament -- Brookdale, Ocean and Gloucester - earlier in the year. According to Vecchiolla, "Alison dominated every match. I've never experienced a player with such focus." Noll herself says she decided to keep the drama to a minimum. "I didn't even want to know my seeding or who I would be playing. I didn't want to get all wrapped up in my head," she explained. Noll notes that an unexpected benefit of playing for Mercer is that she now has a real connection to the college by way of her teammates, who have become close friends. "Initially I was simply going to class and then going home," says the Dean's List student whose academic achievements are as impressive as her tennis skills. "Tennis opened up a lot of things for me outside the classroom." As the summer approaches, Noll plans to take some time off from school and tennis - sort of. She will be giving lessons at Winning Touch Tennis Center in Princeton and the Pennsbury Racquet Club in Morrisville. She says there really is no place she'd rather be than on the court. Noll follows a long line of players who have enjoyed success as members of the Vikings women's tennis team. Since Vecchiolla took over as head coach in 1997, the team has won the four national titles (1999, 2000, 2002 and 2005) and placed second three times (1998, 2001 and 2006).